In the highly competitive business world, supporting one another and building strong relationships can have a great impact on success. In 2016, two Camrosian women, Ashley Meadahl and Louise Jones, felt there was a need for entrepreneurs (specifically women) of Camrose to come together on a regular basis and build relationships, support each other, collaborate on ideas and ultimately learn from one another. The Camrose WOW Networking group are a collective of Camrose women in business and leadership who meet the second Tuesday of every month (except January, August and December) for lunch at a variety of locations throughout Camrose. “WOW targets women who are in business and leadership roles or interested in business,” said WOW coordinator and Rural Alberta Business Centre small business advisor Louise Jones. “During the luncheons, there are not a lot of promotions or selling of the participants’ products/services, it is more about building relationships, collaboration, learning and supporting each other.” The casual luncheons feature local speakers sharing vital information on specific topics that is beneficial to attendees. “There are very strong entrepreneurial women in this community and this is an opportunity to learn from one another.” While there are a fairly regular turnout of some participants, Jones remarked that the number of attendees varies because it is wide open to any woman (no membership) in business or in leadership roles that want to share and support others. “We are always seeing new people – there is a nice flow of new people and regular, but we do cap it at 30 and most meetings are sold out.” In celebration of the relationships gained throughout the year, WOW will be holding their annual Spring WOW Gala on Friday, April 12 at the Camrose Resort Casino, registration at 5:30 and dinner at 6:15 p.m. The Gala’s theme this year is Staying Positive in the Face of Challenges and the evening will feature a champagne reception, swag bar, photo booth, dinner and a cash beverage bar. If you are interested in attending a meeting or finding out more about WOW or are interested in attending the upcoming Gala, visit the WOW Networking group Facebook page or contact Louise at louise@ rabc.ca or by telephone at 780-608-7875. April 8, 1935 ~ April 3, 2019 Mary, youngest of nine siblings, was born April 8, 1935, to parents George and Pauline (Komarnisky), on land purchased in 1927 from The Hudson’s Bay Company. She spent her early years on the family farm by Holden. She attended Fairview School, which was on land purchased by her father from CPR in 1937. Mary and John were married in 1954 and lived on the land John purchased in 1951 where they raised eight children. Their farming consisted of chicken, pigs, cattle, grain and very large vegetable gardens. Mary and John retired from farming in 1975 and moved to Camrose. They were custodians of Sifton School. Mary got her high school diploma, librarian certificate and driver’s license. She was very active with cooking, including at the college and KFC. She worked at Sunny Boy Flour Mill and cleaned at the Hacienda. Mary was very involved with the Ladies’ Auxiliary at the Royal Canadian Legion for forty-plus years in which she also served as president for a time. Mary was involved with the CWL at St. Francis Xavier Roman Catholic Church. She loved doing ceramics and giving them as gifts to her children. She LOVED family gatherings, weddings and planning large gatherings herself that she held at the Holden farm. She loved to socialize, no matter what the event was. She will be forever in the hearts of her children and grandchildren Brian (Jocelyn), Theresa (Brian) Swelin, Monica (Wayne) Chromik, Vivian (Blaine) Fraser, Barbara (Ed) McLaughlin, Roger, Wes (Karen) and Jacquie (Peter) Bennett; nineteen grandchildren; five great-grandchildren; and sisters Margaret Mella and Ann Melnychuk. Mary was predeceased by her husband “Johnny” in 2006; granddaughter Andrea Swelin; and brothers Paul, John, Steve, Harry, Metro and Bill Christian. A funeral service was held at 11:00 a.m. on Monday, April 8, 2019 from Burgar Memorial Chapel, 4817-51 Avenue, Camrose, with Rev. David Eriksson officiating. Inurnment has taken place in the Camrose Valleyview Cemetery. If family and friends so desire, memorial contributions are gratefully accepted to the Royal Canadian Legion – Camrose, the Diabetes Association or to S.T.A.R.S. Air Ambulance. 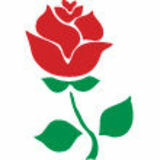 To send condolences, please visit www.burgarfuneralhome.com. Michael Niehaus was born to John and Marie Niehaus at Strome, Alberta, on July 27, 1931 and passed away peacefully at Bethany Meadows - Oak Cottage on March 14, 2019 at the age of 87 years. He was blessed to grow up with five sisters and four brothers. Michael married Donna (Tarnowski) on July 20, 1954, and together they were blessed with eight children Doug (Janet) Niehaus, Monica (David) Blaeser, Veronica (Ron) Reist, Perry (Rita) Niehaus, Val (Steve) Bjornson, Michele (Dwayne) Panas, Danny (Noel) Niehaus and Dennis (Chris) Niehaus. They were also blessed with 30 grandchildren and 48 great-grandchildren. Michael will be remembered for the love he had for his wife Donna, his family, friends and his faith. Michael and Donna raised their family while farming for 20 years in Strome, AB, before moving to Camrose, AB, in 1974. He had many talents; he had a passion for music, sports, cards and volunteering in the community. Michael was a lifetime member of the Knights of Columbus. His passion for music started when playing his saxophone as a child and, the age of 15, he started playing in the band called Rhythm Rascals. He played with them until 1980. During this time, he also played in a number of other bands. Every winter, Michael looked forward to curling with his friends. During his early retirement, he loved to spend all of his extra time with his family. Michael was a devoted husband, father, grandfather, great-grandfather and friend. He will be greatly missed by everyone’s lives whom he touched. Michael faced his last few months with courage and hope. We remember his beautiful smile and his twinkle in his eyes, right up until the time our Lord and Saviour called him safely home. We wish to thank everyone for the comfort, support and acts of kindness shown to our family during this time. A funeral mass will be held at 11:00 a.m. on Saturday, April 13, 2019 from St. Francis Xavier Catholic Church (5010- 48a Avenue, Camrose). If you so desire, memorial donations may be made to Central Cam Vocational Training Association, Camrose, or St. Francis Xavier Church, Camrose. 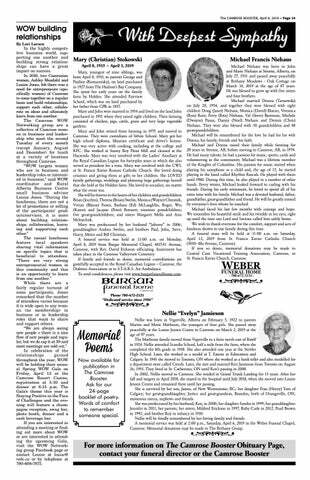 Memorial Poems Now available for publication in The Camrose Booster. Ask for our 24-page booklet of poetry. Words of comfort to remember someone special. Nellie was born in Vegreville, Alberta on February 5, 1922 to parents Martin and Marie Mathison, the youngest of four girls. She passed away peacefully at the Louise Jensen Centre in Camrose on March 2, 2019 at the age of 97 years. The Mathison family moved from Vegreville to a farm north east of Bawlf in 1924. Nellie attended Scandia School, half a mile from the farm, where she completed the 8th grade in 1938. She also attended one year at the Stettler High School. Later, she worked as a model at T. Eatons in Edmonton and Calgary. In 1945 she moved to Toronto, ON where she worked as a bank teller and also modelled for a department store called Creeds. Later, she met and married Ken Jamieson from Toronto on August 26, 1955. They lived in St. Catherines, ON until Ken’s passing in 2000. In 2002, Nellie moved to Camrose. She resided in Grand Trunk Landing for 15 years. After her fall and surgery in April 2018, she stayed in the hospital until July 2018, when she moved into Louise Jensen Centre and remained there until her passing. She is survived by her son, James, of New Westminster, BC; her daughter Fran (Henry) Yam of Calgary; her great-granddaughter, Justice and great-grandson, Branden, both of Orangeville, ON; numerous nieces, nephews and friends. She was predeceased by her husband, Ken, in 2000; her daughter Sandra in 1999; her granddaughter Jennifer in 2011; her parents; her sisters, Mildred Erickson in 1997, Ruby Carle in 2012, Pearl Brown in 1992; and brother Roy in infancy in 1910. Nellie will be fondly remembered by her loving family and friends. A memorial service was held at 2:00 p.m., Saturday, April 6, 2019 in the Weber Funeral Chapel, Camrose. Memorial donations may be made to The Bethany Group.